Pay for Insurance provides a very easy and convenient way to collect Insurance Payments. It is specifically designed for Insurance Providers, like Independent Agencies, Managing General Agents and other Insurance Brokers by Insurance Agents and experienced Insurance Software developers. All you have to do is setup a client and policy with just very basic information, and then collect the payment. You can add a customized disclaimer statement that your client must accept before making payment. When a payment is made, both you and your client get instant email notification. Your customer can instantly view/print/save a pdf format receipt. Your customer can get email reminders before a payment is due. When a payment is made, our system automatically adjusts the due date to when the next payment will be due. 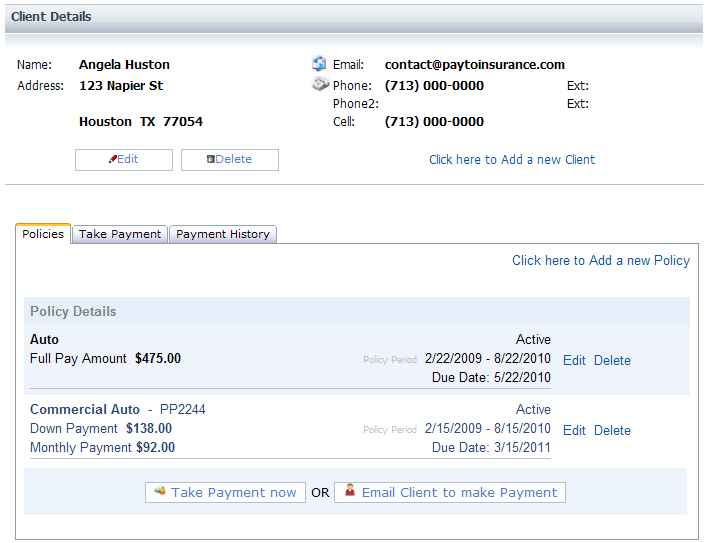 Your customer can view payment history for all payments they made online through our system. You can choose to setup the system so that the transaction fees would be paid by your clients, and you won't have to pay it.